Keeping track of cash with a money counter is miles better than doing the job manually. Besides increased efficiency, is so much more accurate to rely on a powerful machine that also comes with important security features to detect counterfeit bills. A money counter is pretty much essential for anyone who wishes to run a business as smoothly as possible. To be able to get the best money counter for your needs, the first step is to look at some key aspects of what it takes for a money counter to be considered a high-quality and reliable machine. With more capacity comes a speedier counting process. To operate your business more efficiently you should look for models that can hold at least 200 banknotes in the stacker. This obviously depends on your personal needs but, as a general rule, the faster the better. 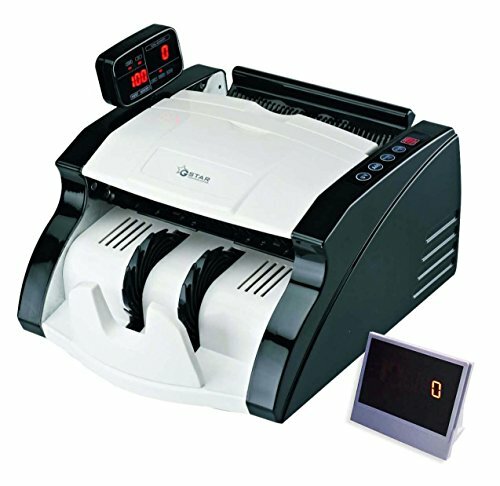 Try to find a money counter which goes over 1,000 bills per minute for a really efficient and speedy counting process. Some of the more advanced models come with batch functions which simplify the job of preparing the money for storage or bank deposits. Also found on more expensive units is the ability to sort currency based on denomination, a very appreciated feature. Any money counter that’s worth buying should have a solid performance, resolving the task with speed and precision. Taking all these elements into consideration is important before you make your decision. To help you with that, a selection of only the best money counters like this one from this article should narrow down your list of possible candidates. Choosing one of these pretty much guarantees that you will get a product that’s been thoroughly analyzed and deemed worth purchasing. Depending on the needs of your business, you might need to make a bigger investment and get one of the more advanced units but if you want something affordable with decent basic functionality, there’s a money counter that fits the bill in here. Boasting some of the most prized features needed for a capable money counter, the G-Star Technology machine is a powerful and accurate solution if you need fast money counting. 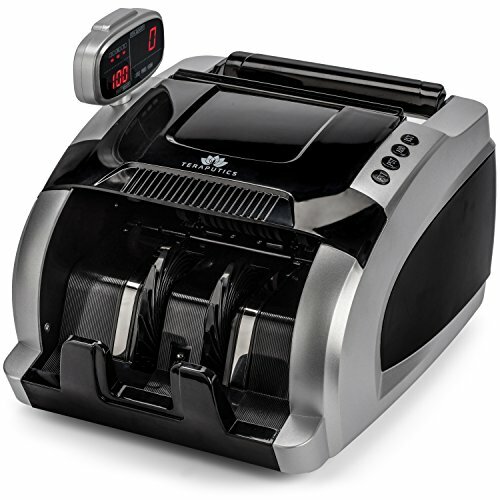 There are some interesting abilities of this unit that we’ll go over in this review and explain why this machine represents one of the top picks for a quality money counter. This is an intelligent digital money counter that can also detect counterfeit bills. It has a system of Ultraviolet and Magnetic sensors which can spot fake banknotes instantly, turning this machine into a secure and efficient money counting tool for homes and businesses. Speed is one aspect where the G-Star delivers performance difficult to match at this price point. The standard model can count 1000 bills per minute while working for 2 hours continuously. All the counting is done automatically with increasing accuracy allowing you to benefit from a lot of extra time as money counting by hand is such a tedious and time-consuming task. It’s important to note that this machine, although very capable of counting how many bills are in a stack, it won’t be able to figure out the monetary total of the banknotes. In other words, it makes no difference for the if it counts 100 $1 dollar bills or 100 $100 dollar bills because the final result will be 100 items in total. If getting the best money counter for the money sounds great to you, this bill counter is a satisfying choice. With a smooth operation, accurate sensors and efficient speed, it can enable you to save a significant amount of time. Considering the relatively low price, this is a really solid investment, all in all. At approximately 900 bills per minute, this money counter is decently fast for a small business. It has some counterfeit detection features and can spot fakes immediately when you drive a stack of bills through the machine. The unit reads ultraviolet print and has sensors for checking magnetic ink. When a bill that doesn’t conform to the legitimate standards is detected, the system pauses to remove the banknote. 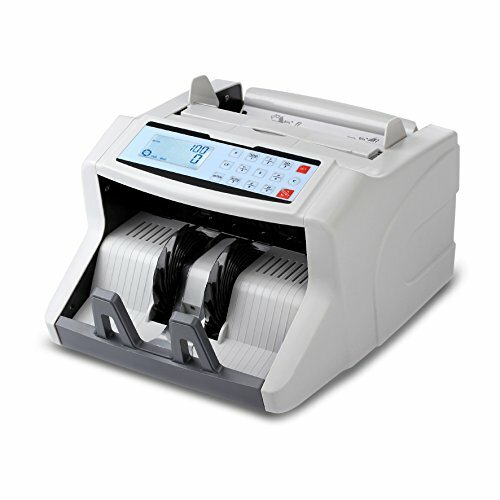 For those with bigger budgets that want the ultimate money counting machine, ideal for large businesses, the Carnation CR1500 is a perfect choice. It’s loaded with extremely powerful functions including multiple currency capabilities and is priced accordingly. Let’s see if it’s worth the money. To ensure uninterrupted banknote counting, it has a reject pocket where all suspected and counterfeit bills end up automatically sorted. 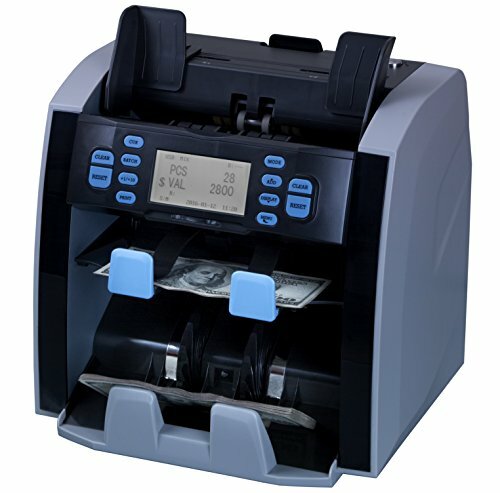 This money counter is able to capture the serial number of every counted bill and store this information or, if possible, print it out. Authenticating any counted banknotes is a breeze for this machine as it makes use of a complex detection system with magnetic, infrared, ultraviolet and image recognition sensors. It’s also capable to figure out the length and thickness of the banknotes. A relatively compact product, it offers a very user-friendly interface thanks to the large and crystal clear LCD display. Depending on the country software, this bill counter can handle up to four different currencies processing the banknotes in all four orientations. Besides the reject pocket, the machine is equipped with a high-capacity hopper and stacker. Many functions for more advanced users are available including add, batch, reporting, and printing features. 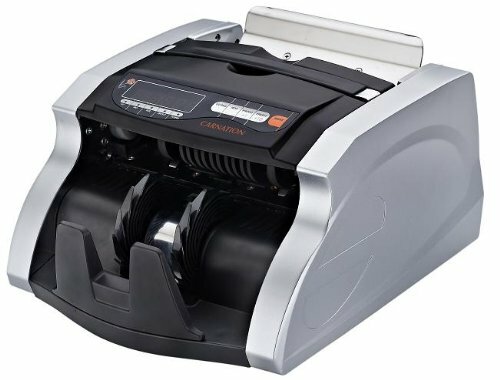 For printing, you can connect it to a printer which is not included, but Carnation does provide a version of this money counter with an added printer that’s slightly more expensive. The user menu and the one used for maintenance provides an intuitive interface for a more flexible operation. For connectivity and to receive software upgrades, an SD card or USB port work well. Maintaining the CR1500 in good condition and to ensure the most reliable performance level, Carnation went for a fully open channel design to fix any possible issues with jamming. If you want a money counter that works with mixed denominations, this one is definitely the best for that as it can recognize banknotes flawlessly, even when they face the opposite direction. This machine is recommended for those who need a money counter for heavy usage. It has a very good price for what it offers and customer service is top-notch too. Coming from one of the leading brands of money counters, Teraputics, this Elite Money Counter offers a superb level of quality and craftsmanship. With a counterfeit detection rate of 1/800000, it’s also one of the most secure units for bill counting. The price feels quite balanced when you take a closer look at the features of this money counter. In terms of efficiency, this machine can count 1200 bills per minute and works without stopping for 6 continuous hours at this speed. It doesn’t differentiate between values of the currency and it only keeps track of the total number of bills but it’s still a very performant machine. When you consider the speed, you’d expect this to be a very noisy unit but fortunately, that isn’t the case as it delivers a quiet operation with noise levels of less than 60 decibels. The counterfeit detection system is pretty advanced, making use of ultraviolet, magnetic, and infrared sensors to guarantee that no fake banknotes sneak into your money stacks. This is a money counter designed with the user in mind and it comes with a very easy to read LED display and a comfortable interface to navigate through the different functions like add or preset counting. A reasonably solid machine in all regards, this Teraputics money counter is also set to consume energy more efficiently thanks to a dedicated mode just for that. It’s important to note that this counter is made to be used only in the United States outlets and any other voltage can damage the machine. 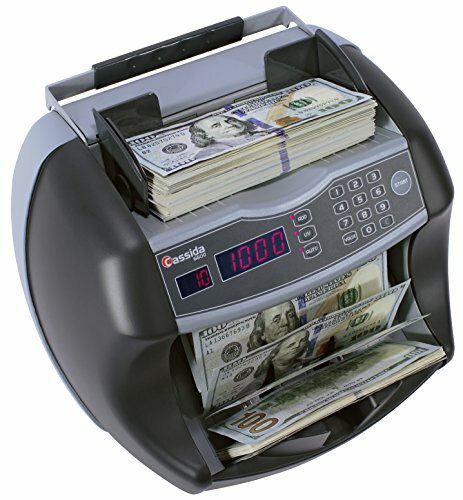 The company managed to create a very accurate and reliable machine for counting bills. The construction gives off a premium feel and it’s safe to say that a tool like this one is essential for many businesses or for anybody who needs to count considerable amounts of cash. Letting this machine do the hard work for you will save precious time. If this sounds like an interesting idea to you, the Elite Money Counter by Teraputics delivers the quality and speed for a very reasonable price and it’s therefore highly recommended. For accurate and hassle-free bill counting, the Pyle PRMC500 seems like a good option. With a practical design and many solid features, this machine deserves a spot on this list. No complaints about the price either which looks to be on par with what this unit offers. This money counter works with some of the most common currencies including Canadian dollars, Euro, and British Pounds besides U.S. dollars. It’s designed for those who work efficiently and quickly as it counts the banknotes with a speed of 1500 bills per minute. It has no sorting abilities but you can’t realistically expect that at this price. To check the authenticity of the money, it’s important for any money counter to have a reliable counterfeit detector. It makes use of infrared and magnetic thread detection besides the common ultraviolet and magnetic sensors. A beeping alarm will sound when a suspected banknote is found. Some very useful features are the Add and Batch functions. With the first one you can keep count of the added bills continuously, while the latter allows for processing banknotes in designated amounts. It’s worth mentioning that this Pyle money counter works with bills in varying conditions of degradation including wrinkled, ripped or bent ones. The top-loading bill feeding hopper is adjustable for fitting the bills correctly and to improve the user experience, it comes with a front panel LCD display and a control panel with buttons for the various settings of the machine. There’s also an included exterior LCD display screen that can be detached. Built with sturdiness in mind and into a stain-resistant housing, it delivers on its promises and can significantly simplify the task of counting the money. If you want an inexpensive machine for money counting, you’ve pretty much found it. Taking into account all the features and the performance of this unit, it’s definitely worth a purchase. Another great product from Carnation is the CR180 cash counter which has been designed to handle the needs of businesses with low to medium volumes of money handling. It offers quite a lot for the money so this is the primary reason why it’s part of the list of the best money counters on the market. The CR180 is packed with many advanced features like the add and batching functions. It lets you add more stacks of bills while keeping track of the overall count. The batch ability enables the separation of your stack into selected amounts. -In terms of detecting counterfeits, it is able to detect the magnetic inks found in the official U.S. currency and the ultraviolet and infrared sensors guarantee that every bill is thoroughly checked for authenticity. With an ability to hold up to 300 bills, the stacker is an important part of the machine and on this unit, it feeds directly into it. A hopper is also available to expand the total capacity with an extra 200 bills. For preventing any kind of jams, this money counter has automatic start and stop features so that you have plenty of time at your disposal to properly load and unload each stack. Nothing to complain about the speed of 1000 bills per minute though it could have been faster at this price level. Still, it’s pretty decent and while the machine runs, the onboard display will show you the count as it progresses. All in all, the Carnation CR180 is a great choice for an efficient money counter. It has a sizable capacity and comes with powerful counterfeit detection capabilities. For many commercial settings, this machine would be an excellent investment. There’s an Elite version of this model and the only difference is the added external display. An extra level of visibility can be obtained by connecting it to the cash counter. 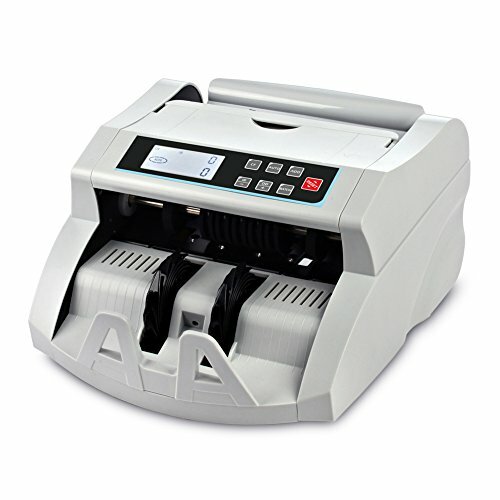 Another great low-cost option for accurate money counting is the Domens DMS-1580T, an automatic bill counter that’s compatible with new and old versions of US dollars. It may not be as performant as some of the more expensive models on this list, but it’s a decent addition to the home or the office of anyone trying to cut a great amount of time when counting money. With a sturdy construction, this money counter feels very durable and comes with a very easy to maintain inner structure. It’s clear that it was built with reliability in mind, to last for a long time. Domens provides in the package replacements, one for the fuse and another for the silicon rubber ring. There are seven sets of rubber wheels used in the pressing process of the banknotes to minimize the risk of a jam and count more fluently. It supports various counterfeit detection methods including ultraviolet, magnetic and infrared sensors. Thanks to intuitive start, stop and error cleaning functions, the money counting process is significantly simplified. The LCD display can count to ”999999” as opposed to the count to ”9999” of LED displays and is much more visible, to read the counting results. It has multiple colors that can be changed and whenever the machine encounters an error, it will turn the screen to a bright red color. 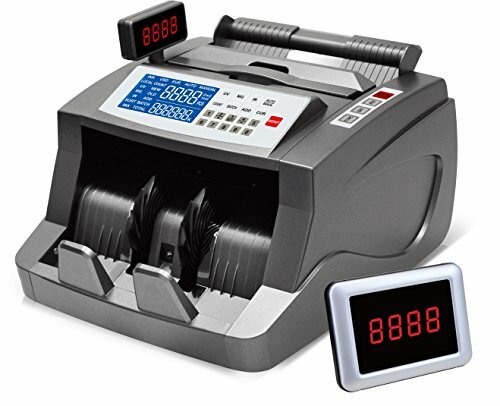 Something that makes this machine a potential candidate for an efficient money counter is the counting speed of approximately 1050 bills per minute which permits a fast operation. It almost goes without saying but it won’t distinguish between denominations as it’s only capable of counting the number of the bills and not the total value. If you need a reliable money counter for saving time and getting rid of this tedious task, look no further than this counter. The counterfeit detection is on point and the accuracy levels are very nice for this price. The customer service is also pretty friendly so this product earns a full recommendation.